Every year there are almost 11 million car accidents in the United States alone, according to the U.S. National Highway Traffic Safety Administration. Anyone who regularly uses a car has a risk of getting into a car accident. That makes a visit to your Arlington chiropractor necessary for relieving auto injuries and preventing them even occurring in the first place. The stronger and healthier your spine, the more likely it can resist the damaging forces of a collision. It is similar to how a structurally sound building can withstand the tremors of an earthquake. If the structure does not have a solid foundation and the ability to be flexible when the earth shakes beneath it, it will likely tumble to the ground, with the repairs being costly and time consuming. The same is true for your body when you are involved in a car accident. Regular chiropractic care can help you keep your spine and the central nervous system in top shape, making an auto injury less disruptive to your life — and possibly even preventing a serious injury. 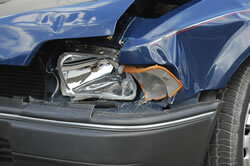 Some auto accidents are bound to cause injuries, no matter how hard you work to prevent it. As an Arlington chiropractor, Dr. Loren Ernst is committed to relieving your auto injury, so you can put the accident behind you. In addition to chiropractic treatments, Dr. Ernst will offer advice on at-home care in order to speed up your recovery. Whether you were in an auto accident last week or five years ago, call our office in Arlington. Dr. Ernst will do what he can to make auto injuries a thing of your past!